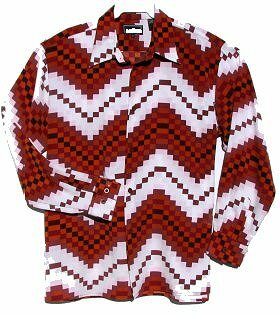 This is a wonderfully lively reproduction 1970s style shirt. It's a well made shirt that is washable and durable enough for a performer. The background of the smooth 100% polyester shirt is white. It is covered with squares that form a geometric pattern. The colors of the squares are very pale pink, copper, maroon, dark mauve and black. The shirt will match brown, copper, rust, maroon or black pants. The shirt has a nice full cut, lots of room in the stomach area. I have the sides tucked back in the above photo. The shirt is actually wider on the sides and can be worn out or tucked in. Flashy Gold or Silver tastefully sized $ sign disco chains are available for $4.50 - $6.00. Men's repro 70s style aviator sunglasses are available in many colors below for $9.00.